IT’S BEGINNING TO LOOK A LOT LIKE DARK VAULT! IT'S CHRISTMAS TIME IN THE DARK VAULT! Well folks, it’s that time of the year again! UNCLE PETE and the Clones have been busy as elves decorating THE DARK VAULT BOILER ROOM for the annual CHRISTMAS FESTIVITIES! There’ll be trees to trim, presents to open, and VITO GOLD will have a couple of great gift ideas that youse needs to buy! Plus we’ll have a gift wrapped package of presentations including some seasonal cartoons and shorts and this week’s feature – the all-time CHRISTMAS CLASSIC that’ll tug at your heart strings (or maybe just cause heart burn) – the ever popular SANTA CLAUS CONQUERS THE MARTIANS! Seems Christmas might not be just for earthlings anymore. It’s a holiday extravaganza jammed packed with green men, ray guns, monsters, toys and Santa Claus himself! 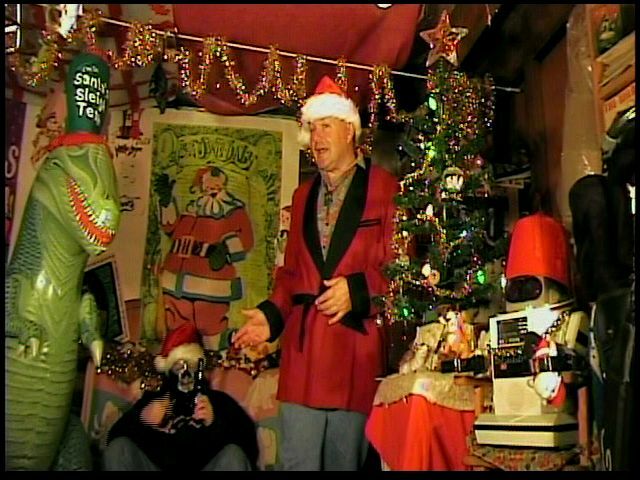 Pull out your eyeballs, robots and lizards and trim your tree along with UNCLE PETE this Saturday night, December 24, 2011, at 10PM and tune in cable channel 4 (in the Binghamton, NY viewing sphere) for the annual DARK VAULT OF PUBLIC DOMAIN CHRISTMAS SPECIAL! It doesn’t matter if you’re naughty or nice, UNCLE PETE is watching you! And we’ll see you this Saturday night, Christmas Eve, for the next DARK VAULT OF PUBLIC DOMAIN! ~ by UNCLE PETE on December 19, 2011.